Born, 1936 Des Moines, Iowa, lives in Denver, Colorado. Potts is the grandson of a former slave and the son of a janitor. His father died when Potts was fourteen years of age. He used his imagination to make things rather than buy them. He created clay model cars and airplanes from cardboard and glue. He was offered a partial athletic scholarship to Drake University but did not graduate. He instead joined the Army, married, and was soon stationed in France. His wife became ill and they returned to seek medical attention at the Army hospital in Aurora, Colorado, where she was diagnosed with kidney failure and soon died. After months of destructive behavior, Potts met Ossie, his current wife and mother of his four children. Much happened in his life which related to his military assignments, including time in Korea, West Germany, and South Vietnam. Potts carved in his spare time and was urged to sell his work at "flea markets" in the Denver area. He was discovered and promoted; receiving due exposure and higher dollar rewards for his acutely carved work. He has been carving full time since his retirement in 1978. He uses found and scrap materials including lumber and paints. The subjects of his work are varied and often contemporary. 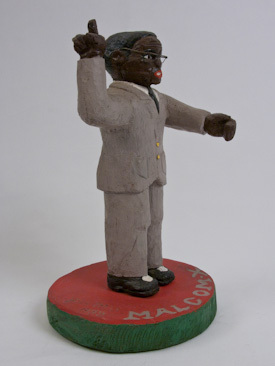 He also pays homage to historic and folk heroes of Black History. The piece we have was made and purchased in 1989. 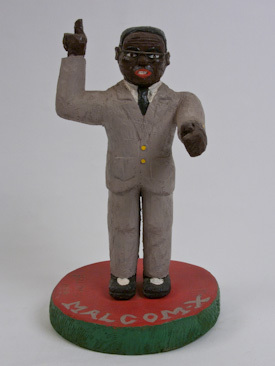 It is a strong and somewhat stout carving of Malcom X. We purchased the work at Art Jones Gallery but always assumed Art Jones had gotten the piece through Larry Hackley. Hackley ventured out as picker and dealer, Jones at that time had little time to travel outside his weekly trips from Lexington, Kentucky to Cincinnati, Ohio to open the gallery on the weekends. Potts exhibitions include the Colorado Folk Art and Artists at the Arvada Center for the Arts and Humanities.